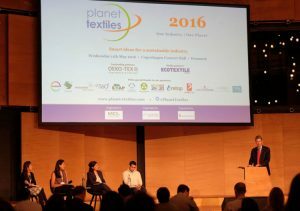 Leading apparel brands, retailers and textile supply chain stakeholders who are moving the needle on environmental issues will assemble in Vancouver, Canada on 22nd May 2018 at the 9th annual Planet Textiles summit on sustainability. The objectives of Planet Textiles in Vancouver will be to share with delegates the latest new environmental initiatives and business models in the textile supply chain; and to show how new technologies, financial innovations can help to increase collaboration, transparency and measurement throughout the industry. Vancouver is currently working to become ‘the greenest city in the world’ through its ‘Greenest City Action Plan’ working the council, residents, businesses, and other organizations to achieve a set of measurable and attainable environmental targets. The Vancouver event follows on from this year’s edition held in Bangalore, India where around 350 delegates debated the issue of water use, conservation and pollution throughout the textile supply chain.